Regarded as one of the most important figures in the history of architecture, Ludwig Mies van der Rohe’s ‘less-is-more’ approach to design was the gold standard for many generations of modern architecture. His... Read more legendary career started humbly at his father’s stonemasonry business, giving him an early appreciation of material and structure. From there he apprenticed with furniture designer Bruno Paul in Berlin before joining the office of Peter Behrens, an architect and painter at the forefront of the modern movement. In 1912, Mies established his own office in Berlin. Through furniture, residential projects and extraordinary, yet unrealized concepts for skyscrapers, he gained recognition as a leader of the German modern movement. As such, he was selected to design the German Pavilion at the Barcelona Industrial Exposition of 1929. His design, a rhythmic arrangement of horizontal and vertical planes of glass, stone and metal was an experiment in free flowing space. With no discernible distinction between rooms or inside and outside, the design fundamentally challenged the architectural ‘boxes within a box’ standard of the time. Inside, Mies included the Barcelona Chair and Ottoman, designed to offer the King and Queen of Spain to a place to rest (they in fact never sat down). The Barcelona Pavilion and the chairs it contained are universally recognized as milestones of modern design. 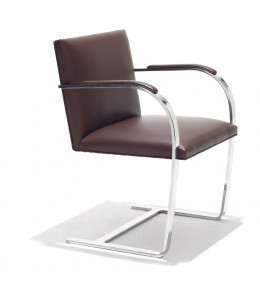 Flat Bar Brno is management level cantilever visitors chair by Ludwig Mies van der Rohe. 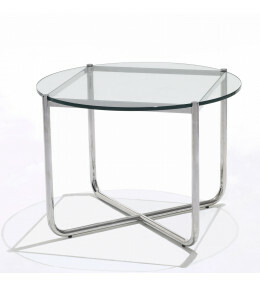 MR Table designed by Ludwig Mies van der Rohe, a seamless tubular steel and glass coffee table. 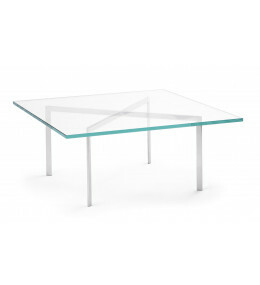 Barcelona Coffee Table, also known as the X Table, was created by Ludwig Mies van der Rohe. 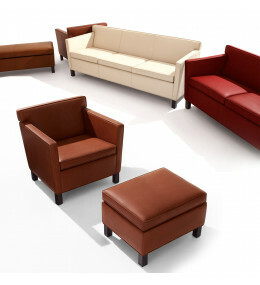 Krefled collection includes a lounge chair, ottoman, settee, sofa, benches, and side/coffee tables. 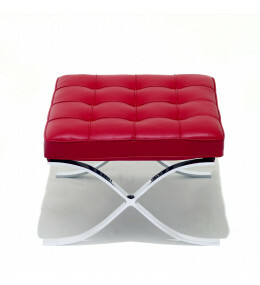 Barcelona Ottoman can make an elegant bench seat in pairs. 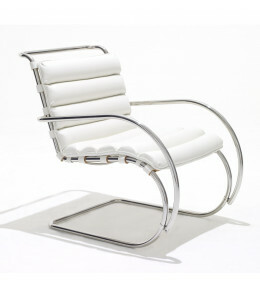 With chromed base and leather upholstery. 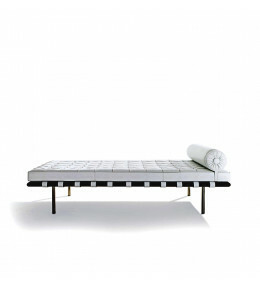 Each Barcelona Daybed, by Ludwig Mies van der Rohe, is made using 72 individual and hand-cut leather panels. 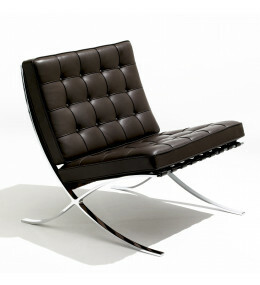 Barcelona Chair designed by Ludwig Mies van der Rohe with hand-buffed frame and individual leather squares. 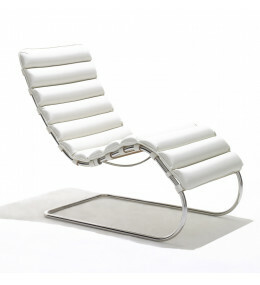 MR Adjustable Chaise Longue with polished chrome steel frame and upholstered leather seat. MR Arm cantilever Chairs with or without arms and three upholstery colours.